Today's' topic was a bit harder for me as I wasn't quite sure what to show you, or me for that matter! I thought about showing you my stash-busting results thus far, but that is something I would like to see at the end of the year when I can look back in awe (I hope) of what I managed to achieve. As my goal is to become a full-time blogger at some point in my near future, this is something that I am very actively working towards this year. With this in mind, I decided it would be the most useful to myself and interesting for you, to show you a little of how my little patch of web has grown over the last four months. Once I had got into this project, it did seem to flow quite naturally :), and I enjoyed the challenge and set about creating an infographic that I could look at and be grateful for. I would like to take this chance to thank you all for your amazing support and interest in my blog. 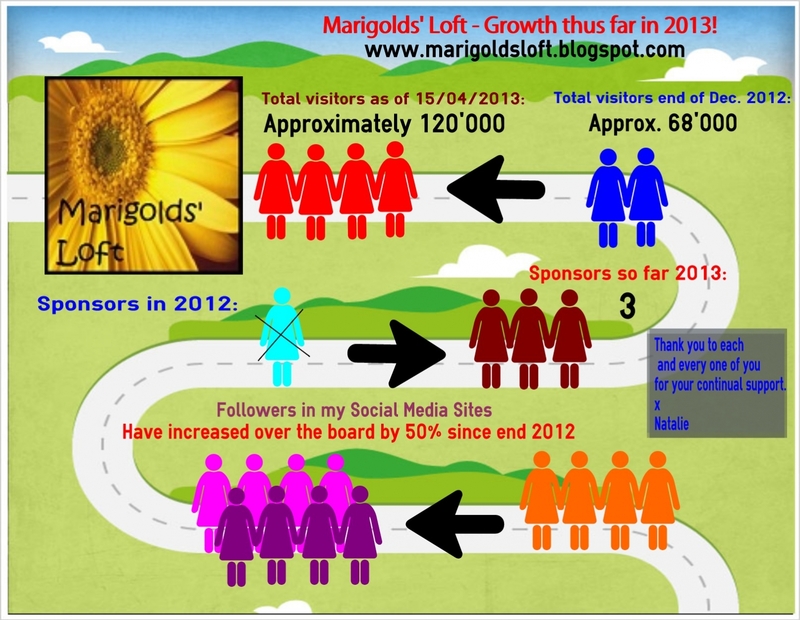 This infographic has shown me just how important and dear my regular readers and followers have become. Without you Marigolds' Loft would be a lonely little page hanging on the edges of the world wide web. Thanks to you it fills my days with joy, happiness and many new and wonderful friends. Wow, that must be lovely seeing your numbers increase like that - well done! I'm having so much fun with this year's Knitting and Crochet Blogging week, I hope you are too. Excellent, you manage to present something completely different. Great numbers! Thank you so much, have a super rest of your Wednesday, hope you are warm? Amazing chart! Congrats on the growth! !